Better known among home winemakers as malolactic bacteria, Oenococcus oeni bacteria are mostly a friendly beast. Winemakers like to introduce selected strains of Oenococcus oeni to most of their red wines (plus, often, Chardonnay). In the resulting malolactic fermentation, the bacteria consume malic acid (the tart acid typical of apples) and excrete lactic acid in its place (the mild acid of yogurt or cheese). Since lactic acid is only half the acid strength of malic, the overall Total Acidity (TA) of the wine is significantly reduced. The flavor rounds out, the aroma mellows, and the wine is generally improved. However, there are times that the work of Oenococcus is not welcomed by the winemaker. Some wines, especially Chardonnay, may have a brighter, fresher flavor profile if the wine only undergoes partial malolactic fermentation. In other cases, the winemaker wants to prevent or stop the fermentation entirely, perhaps making a nouveau-style light-bodied red wine like Gamay Beaujolais. Finally, even after fermentation, eliminating residual Oenococcus may help prevent development of undesirable volatile acids, histamines, and other off aromas or flavors. So, what’s a winemaker to do about the beast? Until now, about the best advice we could give home winemakers who wanted to prevent or stop malolactic fermentation was “get your sulfite level up and keep it there”. Although sulfites do suppress microbial growth, they are also less effective as pH goes up, as temperatures rise and with exposure to air. High pH wines present a particular difficulty for stabilization, because you have to increase the amount of sulfite to be effective. Now, however, a natural product to delay or prevent malolactic fermentation (MLF), used by commercial winemakers for several years is available in a home-winemaker size. The Beverage People are pleased to announce Lallzyme “Lyso-easy”™ liquid lysozyme in a 250 mL bottle. At that size, it can treat from 26 gallons to 130 gallons, depending on the application. Lysozyme, isolated from egg whites, kills gram positive lactic acid bacteria, including Oenococcus oeni, Pediococcus, and Lactobacillus, while having no effect on Acetobacter, Brettanomyces, or yeast. To inhibit the onset of MLF, apply it at the rate of 100 to 125 mL per hectoliter (26 gallons) of wine. To prevent MLF, use 200 mL. To stabilize wine after MLF, use 50 to 100 mL. Lysozyme has no antioxidant properties, so proper use of sulfite is still important. Lysozyme is stable at room temperature fo up to 18 months, but once the bottle is opened, you either must use it or throw out what remains. Before you can be sure that adding Lysozyme is necessary, you need to test the progress of MLF with one or another of the standard tests, the most familiar being Chromatography. You can purchase the supplies to run six tests for $39.95. Purchasing additional paper allows you to run additonal tests with the remaining supplies for a long time. This test takes 8 - 12 hours. A faster home test, also sold at the store is called Accuvin QuickTest ML Kit. The test takes only a few minutes, and requires interpretation of a spot of color against a color standard. Some people don't view this color change as well as others. A third choice is to have a wine lab run a chromatography test from a sample you deliver to them. The newest test is called the Reflectoquant. You bring your 4 oz. sample to The Beverage People and test it yourself with the RQFLEX2™ tester. This method costs $8.95 a test and $3.95 for additional tests done at the same time. Testing takes about 5 minutes. Red wines need to be decolorized by fining with Polyclar, which we have you do prior to the test and this adds about 5 minutes more to the test. If you want to save time, or have multiple samples to run, you can get some Polyclar and add 1/2 teasp. to a 2 oz. wine sample, shake and let settle. Pour off the pink wine to a new sample container and bring the decolorized sample for the test. To delay the onset of MLF 100 - 125 mL / 26 gal. To prevent any MLF 200 mL / 26 gal. To stabalize wine after MLF for storage or bottling 50 - 100 mL / 26 gal. Please note that in white wines, Lysozyme should be removed by bentonite fining before bottling to prevent protein haze. 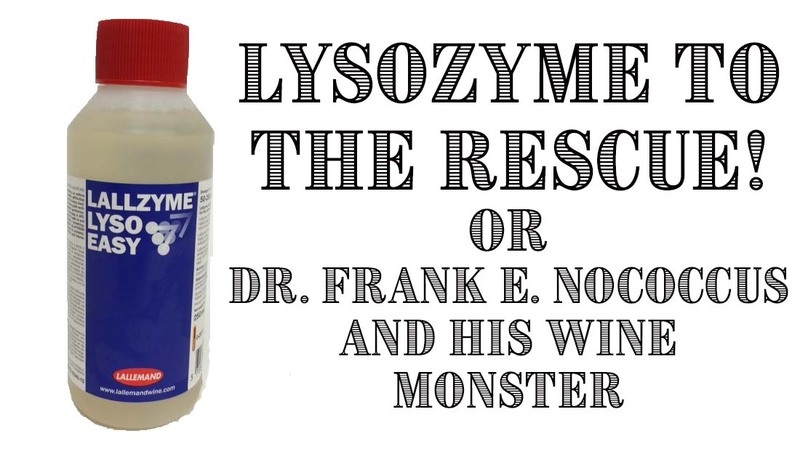 If you need to tame the savage Oenococcus beast in your wine, get Lallzyme Lyso-easy from The Beverage People.